Background: Two angels had come to the city of Sodom to destroy it. But before they could act, they had to extract Lot and his family. Finally after a long night of persuasion, the two angels bodily removed Lot, his wife, and two daughters from the city. After strong warnings to not look back or to stop, the two angels sent them on their way, and once they reached the agreed-upon refuge (Zoar), the destruction of Sodom and neighboring Gomorrah began. Observations: Sometimes when we think of the supernatural, we want to contemplate the nicer elements: angels who bring tidings of great joy, miraculous healings, resurrection. Or when we do consider the terrifying and destructive side of the supernatural, it is easy to attribute it to the demonic, like when Satan acted in Job 1-2. But although God is a God of mercy and grace, Genesis 19 reminds us He is also just and protective. He will not tolerate sin to continue on unpunished forever. Moreover, sin of even one person affects everyone around him. Therefore, deliberate and persistent sin will often move God to act in defense of those being harmed (Gen. 18:20-21). Divine destruction is the result. And what does divine destruction look like? It is sudden. The sun rose that day like on any other day. There was no trumpet call to herald what was about to happen. No ominous sky writing or other warning signs. One minute it appeared to be a normal day. The next, brimstone and fire rained from heaven. It is unexpected. The phrase “the sun had risen” not only marked time but implied a sunny day, with few to no clouds. Out of this clear sky came rain—and not just any rain either. No, this rain wasn’t made of water, which would have been remarkable enough. This rain was made of fire and brimstone. It is complete. The cities were destroyed. The surrounding countryside was obliterated. All the valley burned. All the inhabitants died. Even vegetation did not escape. If it was connected with Sodom, Gomorrah, and the valley they resided in, it was destroyed. Indeed, the destruction was so complete, that even to this day archeology and scholarship cannot pinpoint their location, only offer guesses. It is of God. Because God is sovereign over all, sometimes He is attributed as the source of destruction because He gave Satan the freedom to enact that destruction (compare Job 1:12 and 2:3). As a result, we sometimes want to attribute all “bad things” to Satan. But this passage shows that destruction, especially when done as punishment or judgment, can come straight from God as well. It is occasionally bizarre. 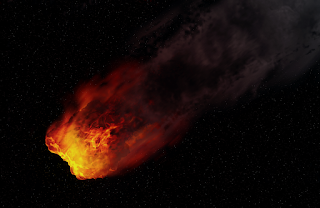 Fire and brimstone, while unexpected, makes a certain amount of sense when it comes to effectively destroying a large area, and it might be reasonably explained now with what we know of meteors and comets. But when Lot’s wife tarried and looked back at her old home, she was transformed into a pillar of salt. This living, breathing person somehow was now comprised of non-living salt. Why? Scripture doesn’t specifically say. Only that this was her punishment for looking back after being explicitly warned not to, its strangeness vouching that it was of God, as He alone could have done something like this. But even in the midst of this destruction, God showed mercy and grace, for this story ends with these words: “God remembered Abraham and sent Lot out.” God didn’t have to rescue Lot. But He did, because mercy triumphs over judgment (James 2:13). Significance: Divine judgment is admittedly an uncomfortable subject. It challenges our perceptions of God’s love, mercy, and grace. It forces us to face the consequences of sin. It reminds us that we will be held accountable and that God’s judgment is inescapable except by the means He provides. And when we are faced with these things, we might have to change how we think, how we act, how we live. But as uncomfortable as diving judgment is, God includes accounts like the destruction of Sodom and Gomorrah for a reason. Not to make us petrified of Him, always fearing that we will somehow accidentally anger Him and He will bop us on the head as a result. For He is gracious and merciful and patient and very slow to get angry. No, Sodom and Gomorrah serve as a warning. It is easy to think when we “get away” with wrongdoing, receiving no immediate punishment for it, that we will receive no punishment at all. Sodom and Gomorrah tell a different story. Punishment may be delayed in order to provide an opportunity to repent (more grace! ), but delayed is not the same as canceled. And because God is God, He can and will administer said punishment whenever He deems best however He deems best. This makes complacency toward sin and presuming on the grace of God quite dangerous! So if the record of Sodom and Gomorrah is terrifying, it terrifies with the hope of jarring us free from such presumptuous complacency so that we don’t fall under the same condemnation. Which proves what a merciful God we truly serve. He did not hide from us this difficult part of His character. He makes it clear what He expects of us and what the consequences of breaking that standard will be. He shows that He is serious about sin and that He will punish in the appropriate way at the appropriate time. He has also provided a way of escape—if we will take it. For God will not force His way upon us. We have a choice—and we can choose not to take His way of escape, like Lot’s future sons-in-law and like his wife. But we must be aware that if we choose to ignore or refuse to take that way of escape, we are choosing to take on God’s judgment on our own…and what hope is there of the natural withstanding the omnipotent wrath of the supernatural?